The Xplor Tour takes you on an adrenaline-filled adventure in the heart of the Riviera Maya, offering jungle, cenotes (sinkholes), and underground rivers all at one site. There are four main activities at the site: driving amphibian vehicles through jungle and caves, rowing a raft along an underground river, flying above the treetops on zip-lines, and swimming in a river surrounded by impressive stalagmites and stalactites. Complete with almost three miles of zip-lines ranging from 150 feet high to 25 feet below ground, as well as over a 1,000 ft of underground rivers, Xplor is a perfect place for an exciting day out. The park also has a restaurant and other facilities that will help you get the most from your day. 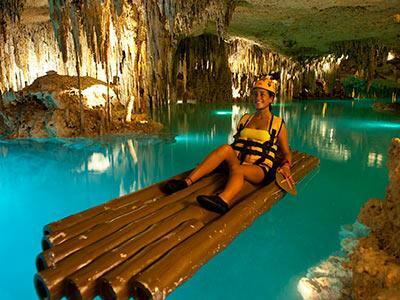 Come and have an unforgettable experience when you book the Xplor Tour during your next vacation in the Riviera Maya!